The Pakistani side had a reasonable practice in the Tour match against the SAf Invit XI before the 1st Test vs. South Africa due to start on February 1, 2013. Pakistanis piled up 329 runs in the first innings and declared their second innings at 9-250. The South African Invitation XI was bowled out for 257 in their first innings and managed to draw the match by scoring 5-190 in the second innings. The First-class match was played on January 25, 26, 27 and 28, 2013, at Buffalo Park, East London. 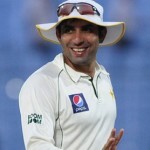 Earlier, Misbah-Ul-Haq, the skipper of Pakistanis, won the toss on the first day and sent in his batsmen without any hesitation to get some batting practice on the South African tracks. Mohammad Hafeez and Nasir Jamshed opened the innings in a superb manner and they shared plenty of time on the wicket while keeping the score board moving. They laid a solid foundation by posting 105 runs on board for the opening wicket as Mohammad Hafeez became the first victim after scoring 55 off 95 balls with 10 fours. The middle order batsmen were unable to utilise the enormous start given by their openers and they fell like ninepins. 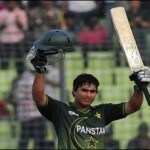 Nasir Jamshed was stranded at one end as the wickets kept on crumbling from the other side. The dependable middle order batsmen, Azhar Ali, Younis Khan, Misbah-Ul-Haq and Asad Shafiq were gone for 2, 5, 4 and 4 runs respectively. Nasir Jamshed was the sixth batsman who went back to the pavilion for 68 off 158 deliveries with 8 fours and the Pakistanis were struggling at 6-145 in 53.2 overs. The wicket keeper, Sarfraz Ahmed and Umar Gul got together and stabilised the depleted innings of the visitors with courageous batting. Umar Gul was the most aggressive of the two and played his shots at will as Sarfraz Ahmed added useful runs from his end. The pair enhanced the score to 226 when Umar Gul was stumped by Dane Vilas off Simon Harmer for 49 off 76 with 2 sixes and 4 fours. Sarfraz Ahmed smashed 93 runs off 161 balls with 1 six and 12 fours as the Pakistanis were bowled out for 329 runs in 102.3 overs. The off spinner, Simon Harmer, was the highest wicket taker with five, Kyle Abbott held three whereas Beuran Hendricks got two wickets. The South African Invitation XI had a miserable start since they lost their three top order batsmen for just 31 runs. Stiaan van Zyl and Vaughn van Jaarsveld stopped the invasion of the rival bowlers with a lot of application. The partnership went past the 100 runs mark and was looking smooth when van Zyl was unluckily run out for 45. Their skipper, Justin Ontong was gone cheaply for seven runs when Dane Vilas joined in with Vaughn van Jaarsveld who was doing well at the other end. The duo lifted the score to 190 when Vaughn van Jaarsveld was declared leg before wicket off Saeed Ajmal for 92 off 125 balls with 1 six and 10 fours. Dane Vilas remained unbeaten for 62 as the innings of SAf Invit XI was rolled back for 257 in 76.5 overs. Saeed Ajmal and Junaid Khan were the main wicket takers with three each, Umar Gul took two whereas Mohammad Irfan claimed one wicket. The Pakistanis went into bat in their second innings while gaining a first innings lead of 72 runs. The openers Mohammad Hafeez and Nasir Jamshed once again were as solid as ever and they started from where they left in the first innings. The home bowlers found it difficult to dislodge the partnership as the batsmen kept on teasing them while dispatching boundaries at regular intervals. They shared another hundred plus partnership by hammering 142 runs when Mohammad Hafeez was caught behind by Vilas off van Zyl for 83 off 109 balls with 1 six and 13 fours. Nasir Jamshed followed him without any addition to the score at 51 as Azhar Ali and Younis Khan remained unimpressive again by losing their wickets for 3 and 14 runs accordingly. Misbah-Ul-Haq consumed a lot of time at the wicket and scored 55 runs off 138 deliveries with 2 sixes and 6 fours as their innings was declared at 250 with just one wicket remaining in 84.4 overs. Abbott was the supreme bowler with four wickets whereas Hendricks, Harmer, Wayne Parnell, van Zyl and van Jaarsveld shared one wicket each. The South African Invitation XI was given a target of 323 runs to win the match and they lost two early wickets for 33 runs. Davy Jacobs and Cody Chetty put their heads down for stabilising the innings and added 37 runs for the third wicket as Jacobs was caught by Younis Khan off Mohammad Irfan for 36 runs. Chetty was the next batsman who surrendered for 29 as the score touched 101 when Vaughn van Jaarsveld and Justin Ontong played vital knocks. The first was gone after scoring 43 runs when he was caught and bowled by Saeed Ajmal and Ontong went on to score his fifty. Justin Ontong kept his cool and occupied the crease for 51 off 81 with 1 six and 5 fours as his side reached 190 with half of their side back in the dressing room. Both captains decided to call off the match with an hour’s play left in the game. Mohammad Irfan got two wickets whereas Umar Gul, Junaid Khan and Saeed Ajmal picked one wicket each. The four day practice match ended in a draw but the Pakistanis must feel comfortable before facing the mighty South African side in the first Test which will commence from February 1, 2013, at Wanderers Stadium, Johannesburg.